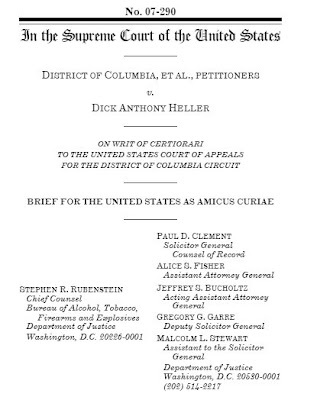 according to this story in world net daily which in itself should be reason enough to be suspicious of the stories accuracy, the bush administration through the office of the solicitor general filed the above amicus curiae brief which seemly calls for the supreme court to rule in favor of the district of columbia. Paul Clement is the Bush administration's chief lawyer before the court, and submitted the arguments in the case that is to determine whether the D.C. limit is constitutional. He said the Second Amendment, "protects an individual right to possess firearms, including for private purposes unrelated to militia operations," and noted the D.C. ban probably goes too far. But his brief urges the Supreme Court to decide most current restrictions on guns and gun owners cannot be overturned by citing the Second Amendment. "Nothing in the Second Amendment properly understood … calls for invalidation of the numerous federal laws regulating firearms," he wrote..."Given the unquestionable threat to public safety that unrestricted private firearm possession would entail, various categories of firearm-related regulation are permitted by the Second Amendment," he wrote in the brief. [T]he opinion creates a huge threat to the constitutional provision banning the "infringement" of the right to bear arms. "If the Supreme Court were to accept the Solicitor General's line of argument, D.C.'s categorical gun ban of virtually all self-defense firearms could well be found to be constitutional…" Pratt said. Worse, when the standard for evaluating gun bans becomes "reasonable," there is nothing else needed in order for a court somewhere to decide that all guns should be forbidden. "In contrast to other provisions in the Bill of Rights, which can only be trumped by 'compelling state interests,' the Second Amendment would be relegated to an inferior position at the lowest rung of the constitutional ladder, should the Justice Department prevail," said Pratt. He said the legal opinion could have been written by a gun limit lobby and it could be used in support of a ban on all guns by a government proclaiming "this is a reasonable regulation" even while affirming the "right" to bear arms. Paul Helmke, of the pro-gun control Brady Campaign to Prevent Handgun Violence, in fact earlier said he saluted the position paper. But Pratt said it would be analogous to the situation in the state of Illinois, where the state constitution provides a right to keep and bear arms, "subject to the police power," he said. Not surprisingly, Illinois has one of the most restrictive atmospheres in the nation regarding guns, he told WND. "Under the administration's amicus brief, a national ban on all firearms – including hunting rifles – could be 'constitutional,' even if the Supreme Court decides – on ample historical evidence – that the Founders intended the Second Amendment as an individual right," he continued. "Rather than argue that 'shall not be infringed' is a categorical prohibition on government gun-banning, the administration has chosen to align itself with those who do not believe in self defense or civilian gun ownership," Pratt said. He said his organization is issuing a public call for the Justice Department to withdraw the anti-gun statements, and is inviting other organizations to join in its battle against such a precedent. In the case at hand, a Washington, D.C., ban on all handguns kept by residents in their homes for self-defense is being challenged. Alan Gura, who is heading up the challenge, said he was troubled by Clement's actions, and described the statements as "hostile" to his Second Amendment position. "We are very disappointed the administration is hostile to individual rights," he said.